Dry chemical fire extinguishers use the multi-purpose Monoammonium Phosphate suppression agent. This dry chemical agent is effective in fighting Class A, Class B, and Class C (involving energized electrical equipment) fires, making it a versatile and frequently used fire suppression agent. Should a fire break out, the time for preparation is over, and making sure that your fire extinguisher is functioning effectively and safely is a task that should be diligently performed on a scheduled basis and according to standards. The process of maintenance is a thorough examination of the extinguisher and its readiness to perform according to specifications. The examination will determine if hydrostatic testing is needed, if repair or replacement of functional components is required, and if a recharge would be pertinent. How often should maintenance of extinguishers be performed? At minimum, an extinguisher should have routine maintenance yearly, preferably performed during the same time each year. 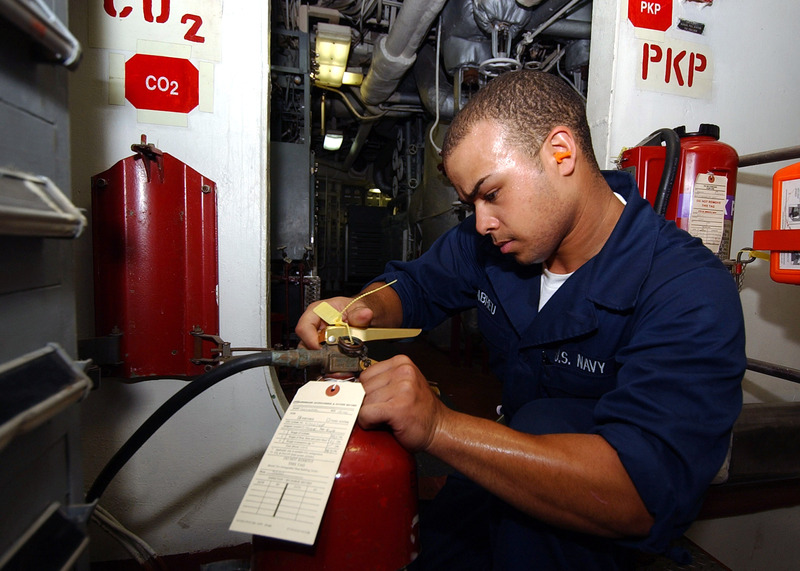 Individuals trained in the identification of extinguisher damage or any non-compliance, the proper use of maintenance tools, application of lubricants, manufacturer’s specific replacement parts and service/recharge instructions should perform the maintenance and record applicable data as required by regulation. Extinguishers that are having maintenance service performed on them should, according to NFPA-10, be replaced by spare extinguishers of the same time and at least equal rating. There is no “down time” in being prepared for a fire emergency. Location: A properly maintained fire extinguisher that is not in its designated location might as well be non-existent. In the case of a fire emergency, speed of action is of the essence. Make sure that each fire extinguisher is in its proper location with its highly visible identifier unobstructed as well as access to the extinguisher. Examination should also be given to the extinguisher wall hanger or vehicle bracket to ensure that it is undamaged and securely mounted. Nameplate: Ensure that the operating instructions, located on the nameplate, are legible. Check the inspection/service tag to determine if a replacement is warranted per manual guideline. Hydrostatic Testing: Fire extinguishers require periodic hydrostatic testing. The nameplate or the actual cylinder will have the date of manufacture. This provides information to determine when hydrostatic testing should be performed according to manual requirements. Extinguisher Gauge: Verify that it is within proper operating range, is undamaged, and the proper type for the extinguisher. Cylinder and Functional Parts. Thoroughly examine the cylinder and all functional parts of the extinguisher for any damage, corrosion, or other identified defects that might impair optimal functioning of the extinguisher. Replace or repair any parts with any of these conditions. Special attention should be given to offshore extinguishers as they are subjected to the extreme environmental hazards of water, sun, and sea and therefore treated with a special protective coating. Nozzle and/or Hose Assembly: Examine for any cracks, cuts, or other visible damages, including to the top portion of the valve assembly. Specifically check the thread for damage and compromise to its integrity. If there is a hose retainer band, ensure that it is secure and properly retains the hose. Handle and Operating Lever: These structures are usually fastened by rivets that should be checked for damage, making sure that they are secure and properly formed to part contour. Extinguisher Weight: You must weigh the extinguisher and compare the actual weight with the listed total charged weight as noted on the nameplate. A discrepancy would warrant further examination and probably a recharge, followed again by a weight comparison. Clean: A fire extinguisher should be free from any dirt, grease, or foreign substance of any kind. Any debris should be wiped away with a damp rag. Tagging and Recording: After completion of the examination, the extinguisher should be properly tagged per NFPA-10 guidelines and all applicable records completed and verified. Extinguisher Returned to its Designated Location: Remove the temporary extinguisher and return the examined and verified extinguisher to its mount. Again, take this time to ensure that it is properly mounted, is visible and accessible, and unobstructed from any obstacle to its securement should a fire break out. Ensuring that your fire extinguishers are in top working order and readily accessible are essential elements in a fire safety program. Regular and proper maintenance of fire extinguishers provides first responders with the most important tool to suppress a small fire before it can get out of control and lead to extensive property damage and potential loss of life. Diligence and consistency to these standards provides the best preparation for combating a fire and preserving that which is so valuable.